Its hard to belive that how politics creep in every kind of developement in our country now. Mumbai got a beutiful jewel like sea link after GateWay of India.But it is not skip from politician attention. Every political party has concentrated on Vidhansabha elections. And I think Congress is trying to show the maharashtrian people that they are on roll to develop maharashtra. 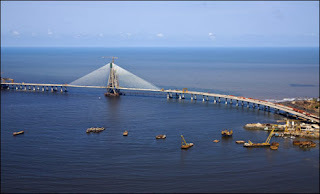 Sea link is part of their developement as they say. And my opinion about the name given to sea-link is straight and simple.Sealink recides in maharashtra. Maharashtra have history of many great non political personalities. Besides that a name given to sealink is person who political family history is more that 100 years. Lots of Maharashtraian marathi people give their whole life for freedom and to save their soil. The great venture sealing deserves name of such people who done well in history.Their name is not have bad records like these politicians. Its insult of all the Maharashtrian & Marathi people and never be tolereted. July 16, 2009 at 5:26 AM delete This comment has been removed by a blog administrator. July 21, 2009 at 2:04 AM delete This comment has been removed by a blog administrator. July 25, 2009 at 1:58 AM delete This comment has been removed by a blog administrator. July 31, 2009 at 10:44 PM delete This comment has been removed by a blog administrator. September 1, 2009 at 5:49 AM delete This comment has been removed by a blog administrator. September 26, 2009 at 2:06 AM delete This comment has been removed by a blog administrator. October 14, 2009 at 5:04 AM delete This comment has been removed by a blog administrator. November 2, 2009 at 1:35 AM delete This comment has been removed by a blog administrator. November 3, 2009 at 12:58 AM delete This comment has been removed by a blog administrator. November 4, 2009 at 12:00 AM delete This comment has been removed by a blog administrator. November 5, 2009 at 10:41 PM delete This comment has been removed by a blog administrator. November 7, 2009 at 12:32 AM delete This comment has been removed by a blog administrator. November 8, 2009 at 10:57 PM delete This comment has been removed by a blog administrator. November 9, 2009 at 11:18 PM delete This comment has been removed by a blog administrator. November 10, 2009 at 11:36 PM delete This comment has been removed by a blog administrator. November 11, 2009 at 11:16 PM delete This comment has been removed by a blog administrator. November 13, 2009 at 2:24 AM delete This comment has been removed by a blog administrator. November 14, 2009 at 3:23 AM delete This comment has been removed by a blog administrator. November 16, 2009 at 2:42 AM delete This comment has been removed by a blog administrator. November 18, 2009 at 11:16 PM delete This comment has been removed by a blog administrator. November 19, 2009 at 10:46 PM delete This comment has been removed by a blog administrator. November 20, 2009 at 11:31 PM delete This comment has been removed by a blog administrator. November 23, 2009 at 12:18 AM delete This comment has been removed by a blog administrator. November 23, 2009 at 12:19 AM delete This comment has been removed by a blog administrator. November 23, 2009 at 11:31 PM delete This comment has been removed by a blog administrator. November 25, 2009 at 1:22 AM delete This comment has been removed by a blog administrator. November 27, 2009 at 12:12 AM delete This comment has been removed by a blog administrator. November 27, 2009 at 10:34 PM delete This comment has been removed by a blog administrator.